Globe making developed rapidly during the European Renaissance as a result of technological developments such as printing, and the availability of Latin translations of Ptolemy’s treatise Geographica in the early 15th-century. The earlier Islamic tradition of globe-making focused mainly on the celestial globe, but Ptolemy’s work and new discoveries made by European voyagers provided the stimulus to develop the terrestrial globe as a scientific instrument. By the end of the 15th-century, globe-making had become a well established craft in Europe. Earlier celestial globes were usually made of metal and were the work of silversmiths and engravers. But with the invention of the mechanical printing press in the 15th-century, it became possible to print paper gores which could be cut and pasted onto a sphere. The craft of globe-making therefore became the province of printers and publishers. The construction of the printed globe began with creating a hollow sphere out of pasteboard glued together in layers similar to papier-mâché. Two hemispheres were created which would then be mounted on a wooden frame and axle and sewn together. The sphere would then be covered in plaster and turned against a former to create a smooth surface. Inevitably the weight would not be distributed evenly and the globe would be imbalanced. The process of balancing the globe involved gluing small packages of lead shot in cloth on the inside of the globe to prevent it from slumping into one position. 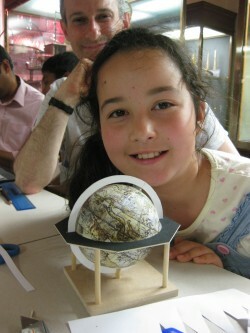 Printed gores would then be cut from paper and pasted onto the plaster sphere. The photos below illustrating the process are provided courtesy of Paul Cook, Paper Conservator at the National Maritime Museum. The downloadable PDFs and video demonstration below provide a guide for making a small model globe and give some idea of the processes and challenges involved in the craft of globe-making.